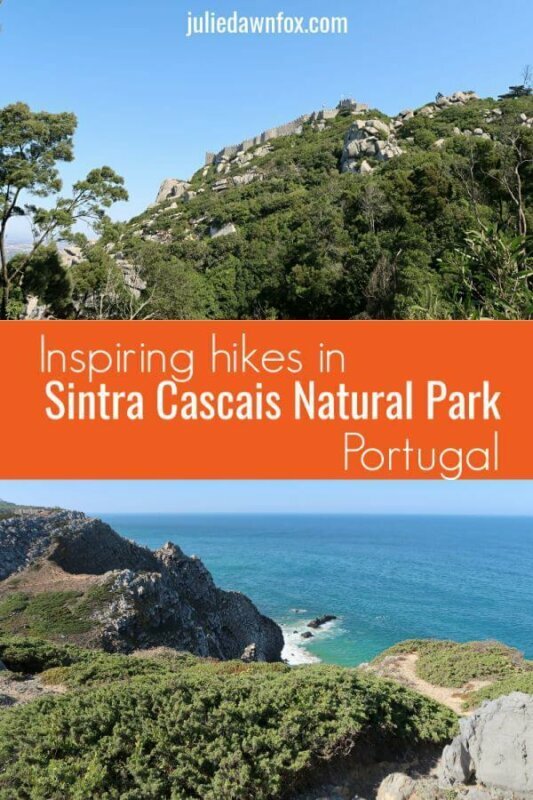 If you’re looking for somewhere to go hiking near Lisbon, Sintra Cascais Natural Park has a wide range of walking trails to suit different fitness levels and interests. You can opt for shaded forest paths in the Sintra Mountains near several UNESCO World Heritage monuments or explore the park’s fascinating rugged coastline and sandy coves to discover some of the best Sintra beaches. Over the years, I’ve tried several Sintra hikes, with varying degrees of success. Some are reasonably well-marked, or at least it’s not too hard to find your way back to Sintra or your car if you lose the trail. Others are plain frustrating without a knowledgeable local guide to lead the way. 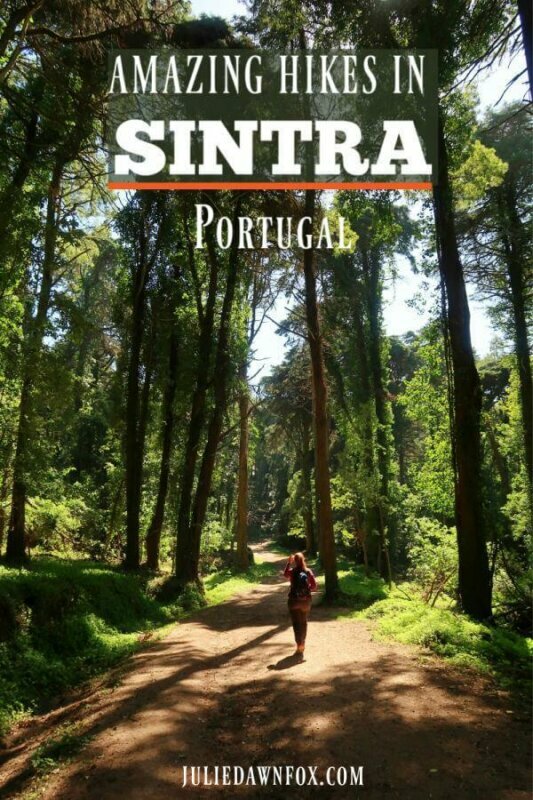 Find out which Sintra hiking trails would suit you best and what you need to know before you set off. My first attempt at following the supposedly marked walking trail from Peninha sanctuary to a (possible) megalithic burial site and back to the car failed. Dori and I found the sanctuary and the amazing views it commands without issue as we had parked within sight of it. The problem came when the waymarkers in the forest disappeared. Although we had a couple of printed leaflets that should have helped us orientate ourselves, we ended up having to slog our way back up the tarmac road and frankly could not be bothered trying to track down the dolmen as we were hot, sweaty and fed up by this point. I wasn’t ready to give up completely on this hike so I tried again on a subsequent visit, this time with a local walking tour operator. What a difference! Teresa, my guide for the day, parked in the pretty, whitewashed village of Ulgeira and we set off for the forest, which to begin with was mostly pine, oak and acacia. Teresa told me how the forests we would be walking through had been influenced by King Fernando, the guy who built Pena Palace and introduced exotic trees and plants into the surrounding park. These new species spread and, of course, had an effect on the local ecosystems. Coupled with the geographical peculiarities of Sintra Mountains, this means that the forest changes as you progress through it and we were soon amid tall juniper trees. 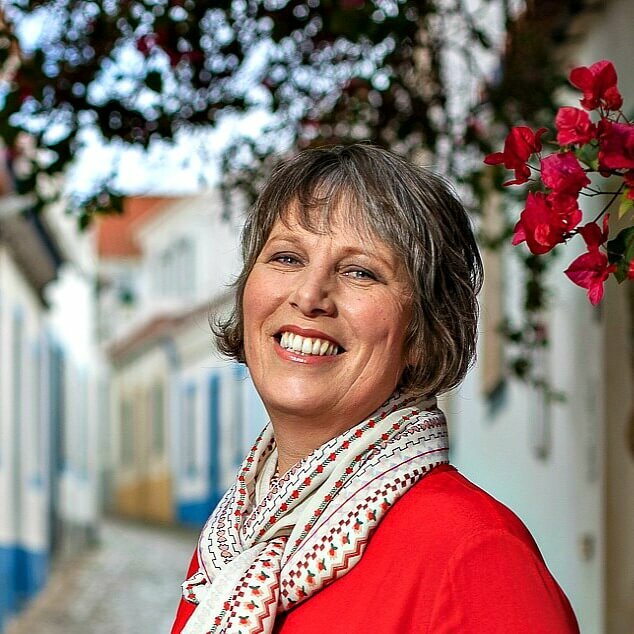 Teresa is also fascinated by history and had some interesting insights and theories to share about why the Sintra Mountains are known as Moon Mountain (hint: it’s part geology, part mythology and deep connections with the feminine). I also learned how the Templar Knights and other civilisations/groups sought shelter in these special mountains. We found the elusive dolmen, known locally as Anta Andrenunes. At first, I didn’t even realise that the massive pile of rectangular-shaped granite rocks was a dolmen. This only becomes apparent from the other side of it and although there is no official proof that it is a megalithic burial chamber, it certainly resembles others that I’ve seen in Portugal. With Teresa’s help, I climbed to the top of the dolmen for 360º views of the Sintra Mountains, Pena Palace and the Moorish Castle and the coastline of the Sintra Cascais Natural Park. From here, on a clear day like the one we had, you can also see Mafra Palace and the Montejunto Mountains to the north and Cabo da Roca headland and lighthouse to the south. There are, in theory, marked trails that incorporate one of my favourite Sintra sights, the mysterious and atmospheric Capuchos Convent. Sadly, given my experience of attempting to follow the Peninha trail and knowing that the local council is not on top of keeping these trails marked and maintained, I am not willing to risk a self-guided hike. When a friend and I walked there from Sintra many years ago, we followed the tarmac road, which I wouldn’t recommend (not much shade, no pavement and fast cars). Take a cab/Uber if you’re not interested in hiking there. Dori and I had a far more successful day when we decided to follow part of the GR-11 walking trail that covers 35 kilometres of the natural park. Our plan was to walk along the clifftops from the lovely Praia da Adraga, one of the best Sintra beaches, to the clifftop village of Azenhas do Mar then take a cab back to the car park at Adraga if we couldn’t face the return journey after lunch. The first few hundred metres were hard work as we had to climb a loose-sand path but once through the trees and at the clifftop, things got much easier. The views definitely compensate the brief struggle. From here, we were able to easily follow the red and white markers through low bushes towards another fabulous viewpoint overlooking Praia Grande and its dramatic cliffs. A little further along, we spotted a wooden staircase that was built to enable people to see the dinosaur footprints on the rockface. Note: Even then, it was forbidden to use these steps without authorisation but I believe that a recent rockfall has damaged this area even further so I’m not sure what’s actually visible now. When we were there, you could make out dents in the smooth surface of the stone, even from the clifftop. After that, the trail heads inland and then downhill to reach the massive expanse of sand that is the aptly named Praia Grande (Big Beach). 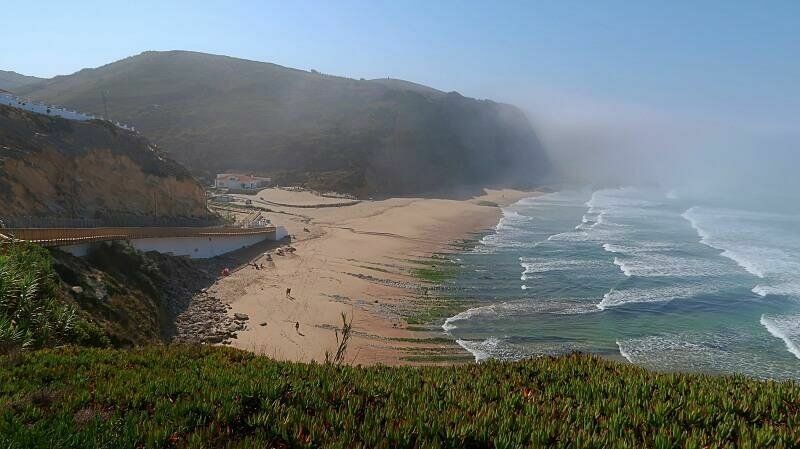 As with many of the Sintra beaches, this is a popular spot for surfers. If you want to swim but the ocean is too rough or cold, there is a large swimming pool at the far end but I expect you will have to pay a small fee to use it. We then followed the route along the clifftops to Praia das Maças, a large sandy bay that is connected to Sintra old town by an electric tram service. By this point, we were too hot and hungry to go any further so we had lunch and walked back. The worst part about that was knowing we had to walk back up the hill from Praia Grande along tarmac roads but that wasn’t actually as bad as we’d anticipated. There’s almost no shade on this coastal trail so make sure you wear a hat, sunglasses and sun cream. Long trousers will save your legs from low shrubs. It’s not a bad idea to cover your arms as well – Dori and I had to push our way through closely packed bushes. The clifftops are fragile so stay on the marked paths and DO NOT TAKE RISKS. It took us about 1.5 to 2 hours each way to do this section. 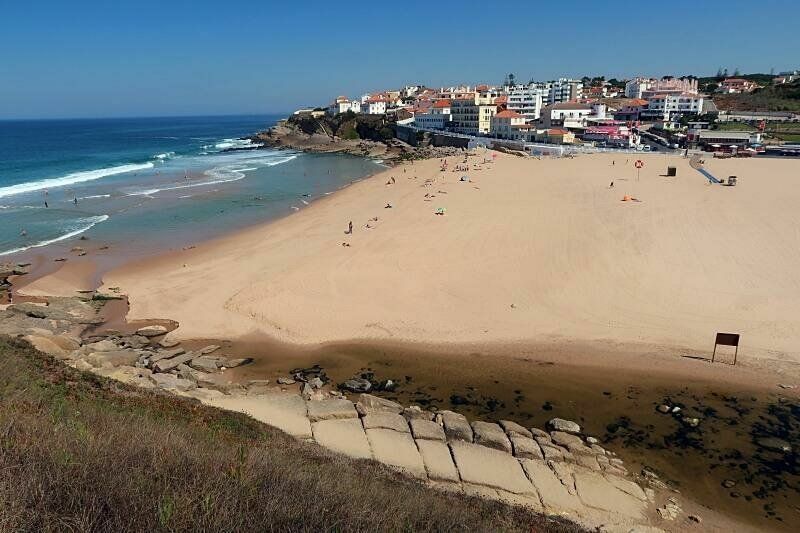 You should be able to get a cab from either Praia das Maças or Azenhas do Mar if you make it that far and there’s a car park at Praia da Adraga and a great seafood restaurant. 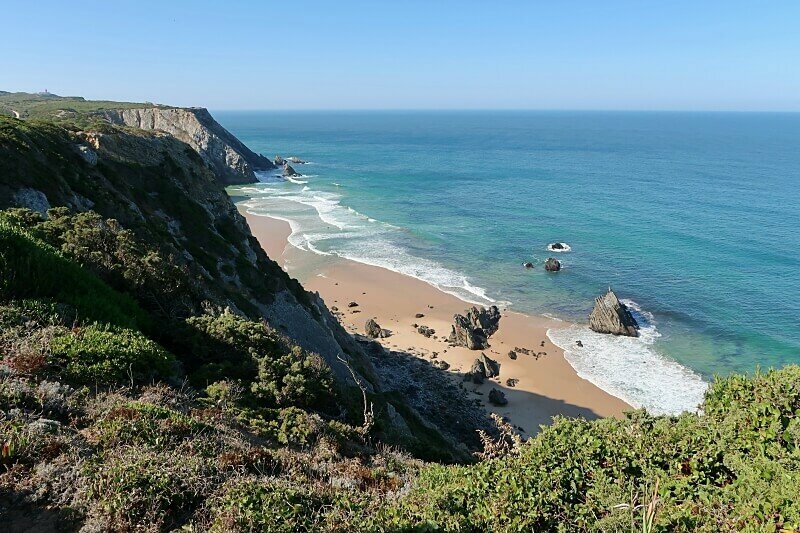 For a gorgeous, worry-free guided walk along Sintra’s stunning coastline, complete this enquiry form. The GR-11 does actually continue north along the coast from Azenhas do Mar to Praia do Magoito, at which point it veers inland. I haven’t walked this section so I can’t tell you what to expect. As well as the main Sintra beaches, there are lots of tiny hidden coves within the Sintra Cascais Natural Park that are harder to get to but worth it if you like a challenge more than I do. I wouldn’t recommend you try finding these without a local guide though. Like most people, the very first time I visited Sintra, I went to Pena Palace. Although I enjoyed visiting the colourful and eclectic monument, I think I got more pleasure from the walk around the surrounding park. I dutifully posed on the Queen’s Throne rock and climbed up to see the statue of the warrior but I may have wimped out at the prospect of hiking up to Cruz Alta (High Cross). On my most recent trip to Pena Park, Mike and I started at Chalet da Condessa D’Edla, a unique and beautifully reconstructed home at the top end of the park. After visiting the chalet, we followed the trails through the forest to discover the azalea garden, an antique aviary, an extremely grand rabbit hutch and the various animals in Pena Farm before reaching the Valley of the Lakes, which I remembered from that very first visit. 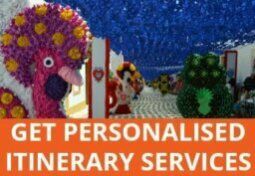 You can buy a combined ticket if you also wish to visit Pena Palace or just pay to explore the park and the chalet. Pick up a map at the entrance which shows the main trails and points of interest. Even with the map, we did get a bit lost and confused at times but the hilltop Pena Palace serves as a handy reference point. Since this walk is through a forest, there is plenty of shade and the paths are generally in good condition so you don’t need special hiking gear although sensible shoes/trainers are advisable. This is an easy walk that’s suitable for all the family and there’s a hop on hop off bus service for those who find walking difficult or simply don’t fancy the hills. Allow anything from 1 to 3 hours just for the park, depending on your pace and curiosity/energy levels and whether or not you opt to take a picnic to enjoy within the park. If you’d prefer to do a guided walk in and around Pena Palace and Park, get in touch. Unlike the trail I followed years back from the old town to the Moorish Castle and Pena Palace, the Villa Sassetti trail avoids the roads. Not only does this eliminate the risk of getting squashed by a bus or tuk tuk, it’s also easy to follow (once you find the start point) and there are no exhaust fumes to spoil your time in nature. It’s a steep trail that skirts the base of Peneda da Amizade, where you might see rock climbers dangling, and its namesake, the recently restored Sassetti Villa. You’ll get great views from breaks in the greenery as you wind your way up or down the hill. This is steep and some of the path is quite uneven so this is not suitable for everyone and you need decent footwear. Trainers or proper walking sandals would be okay but nothing less sturdy. Mike and I chose to walk down, rather than up, and were very pleased with our decision. It was enough of a challenge for us on a hot September afternoon and we felt sorry for those slogging and sweating their way in the opposite direction. The trail is mostly shaded but you should still apply sun cream and wear a hat in hot weather. Take plenty of water, especially if you are going uphill. There is a café on the trail but it only serves drinks and light snacks. The lower entrance is at the top of Estrada da Pena, just next to the picnic area (Parque das Merendas). The trail downhill starts at the end of the car park opposite the Lakes Entrance to Pena Park. In other words, cross the road and walk through the car park then follow the signs. You might find these leaflets more useful than I did, but you’d be much better off picking up a paper copy of the trail from the tourist information centre. 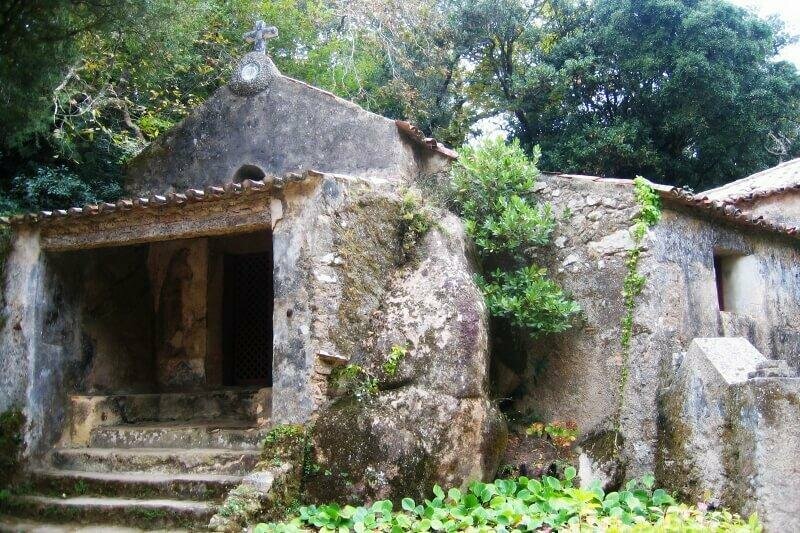 This is a short (under 2 km) circular walk that takes you around the edges of Sintra old town. You’ll see some of the town’s most attractive public water fountains, the Romanesque-Gothic church of Santa Maria, a great viewpoint and the pretty Parque da Liberdade. This is easy and doable for almost anyone as the trails are mostly along roads and the only climb is gentle and low. 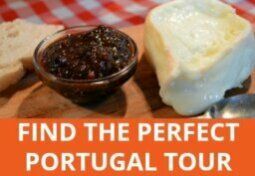 Start with your back to Sintra National Palace and bear right as far as the tourist information centre then take the first left and keep left at the fork. See the map here as I’m not sure how reliable the markings are. 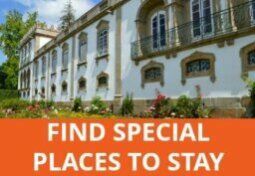 Check out these Sintra hotels and guest houses if you’re tempted to stay overnight. Next Post: In-depth Expert Guide To Algarve Golf Courses. Which Is Best For You? Haven’t been walking down that way for quite a number of years. Sounds like it’s time to try again. Thanks! Very nice walking trails. I know some of those areas, but never attempted the trails. Have a nice weekend Julie.